Startups in Silicon Valley would tell you that the automotive future is near, and it involves car sharing, autonomous driving, and all-electric motors. It’s a future most traditional automakers also believe in. But just when that future will arrive is up for debate, which creates an expensive conundrum for established international automakers. With a huge global workforce and pension obligations to millions of retirees, automakers—unlike tech startups—really can’t afford to make wrong or mistimed bets. Despite Tesla Inc.’s recent perceived success, its sales are minuscule compared to the total market. There’s a huge gap between the type of cars consumers think they want and what they actually buy. 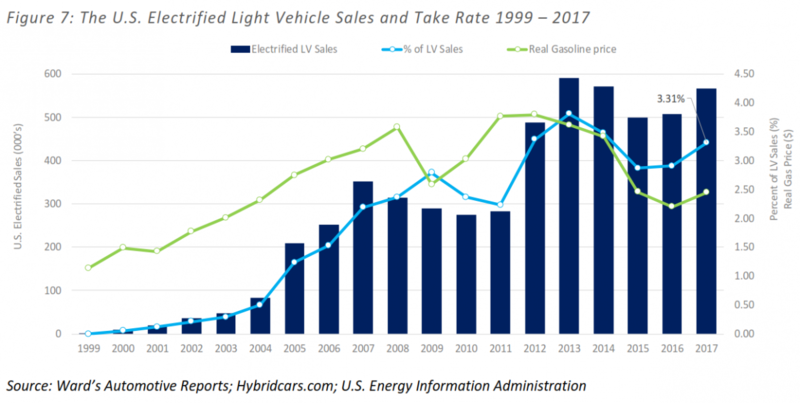 In 2017, only 3.3 percent of all light vehicles sold in the United States were electrified—with the majority being hybrids which still rely on internal-combustion engines—according to data from the Center for Automotive Research (CAR). In the end, most consumers still opt for traditional gasoline cars for a variety of reasons, including lower prices, more established dealership support, known reliability, or due to the far greater number of gas stations dotting the country compared to electric charging stations. Nearly every major automaker is investing in electric vehicle technology. BMW, a luxury segment leader, says it plans to market 12 fully electric models by 2025. General Motors Co. plans to offer nearly 20 fully electric models by 2023. Toyota Motor Corp., which was an early proponent of hybrid technology, is investing in fully electric powertrains. Even Volkswagen AG, which invested heavily in clean diesel technology, has pivoted to electric powertrain tech following its recent diesel-emissions scandal. The push for electrified cars was largely driven by the global regulatory environment. Countries such as France, South Korea, and Norway have regulatory mandates to promote electric vehicles, while in the United States, the state of California has tighter emissions regulations than the rest of the country. With a huge global workforce and pension obligations to millions of retirees, automakers can’t afford to make wrong or mistimed bets. But the United States may be putting the brakes on electrification requirements. The U.S. Corporate Average Fuel Economy (CAFE) standards—which requires automakers to meet fleet-wide fuel economy minimums—is up for review, according to the Environmental Protection Agency (EPA) under President Donald Trump. The current rules were released in 2012 and require automakers to meet 54.5 miles per gallon on average by 2025. While no specific guidance has been released, the new EPA leadership is widely expected to ease CAFE adoption, by either freezing or slowing the rollouts of these mandates. One definitive trend in the industry is the abandoning of diesel technology. After Volkswagen’s recent emissions scandal, diesel’s fate seems to have been sealed. The top administrative court in Germany ruled late last month that German cities can ban diesel cars, a landmark ruling that can lead to similar action across other nations in Europe. The non-profit organization Environmental Action Germany petitioned the court after around 70 German cities exceeded European Union mandates for nitrogen oxides. It matters little that the potential bans only apply to older vehicles; consumers in Europe, traditionally the biggest market for diesel vehicles, are already shifting away from the technology. Numerous large cities—including Madrid, Paris, and Mexico City—have enacted laws to ban diesel vehicles from their urban centers within seven years. But the real acceptance of electric vehicles trails its hype. With so many experts pushing the narrative that electric vehicles will soon take over the streets, it’s become increasingly unclear if the recent push to invest in electrification technology is driven by real consumer preferences or political pressure. The adoption of electric cars has a direct impact on the theory of “peak oil demand,” an energy industry term for the point which oil demand will begin to decline due to the advent of alternative energy sources. Traditionally, peak oil demand is estimated to arrive sometime between 2040 and 2050. This timeline has been continuously pulled forward in recent years due to the anticipated exponential growth of electric cars. Fitch Ratings, in a Feb. 20 report, estimated that oil’s peak demand could now arrive as soon as 2030 due to increasing electric car sales. But this trend puts downward pressure on oil—and thereby gasoline—prices. And lower gasoline prices tend to delay adoption and sales of electric vehicles. This has been playing out in the marketplace. Against a complex regulatory backdrop and depressed gasoline prices, there’s an additional complication of consumer preference for bigger, gasoline-driven vehicles. U.S. consumers tend to drive longer distances and place greater importance on comfort, performance, and size, which are often detrimental to achieving higher efficiency. As of 2016, more than 30 percent of U.S. driving takes place in rural areas, according to data from the Department of Transportation. “Consumers define vehicle performance in many ways, but the relationship between horsepower and weight is a critical performance factor for many U.S. consumers,” said a CAR study. These are two characteristics lacking in most of the accessibly priced electric cars. The Ford F-150 pickup truck has been the best-selling vehicle in the country for over a decade. Reuters compiled a list of January 2018 auto sales by brand, and the industry-wide trend is that sales of pickup trucks and SUVs continue to grow while passenger car sales continue to decline. “We see a continued shift into SUVs,” declared Ford Motor Co.’s U.S. head of sales Mark LaNeve in a conference call with analysts on Jan. 25. As such, U.S. manufacturers have prioritized the building and sales of bigger trucks, SUVs, and CUVs, which are rarely electricity-driven and tend to be more profitable than smaller cars. 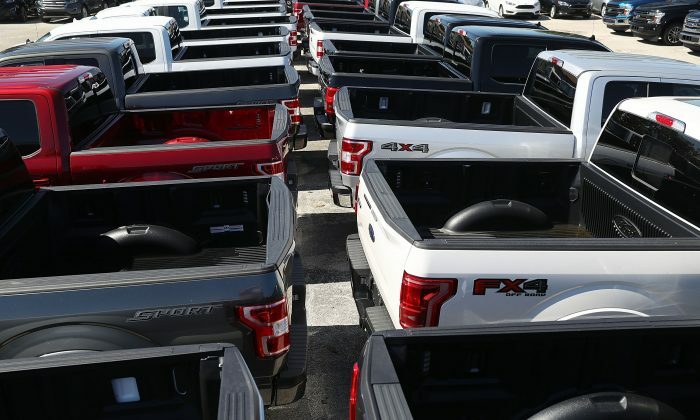 Profit margins on trucks and SUVs can reach $10,000 per unit sold. In comparison, electric vehicles have so far been a loss-making endeavor. Tesla, the all-electric automaker, lost nearly $2 billion in fiscal year 2017. While established automakers seldom disclose model-level profitability, Fiat Chrysler Automobiles boss Sergio Marchionne told a Brookings Institution panel a few years ago that his company suffered a $14,000 loss on each Fiat 500e electric car it sold, according to electric vehicle website InsideEVs.